When it comes to Mexican folk art, crafting is generally a family affair–techniques and styles are passed from old to young. Subsequent generations add their own “spin” to the family craft, and as a result, Mexican folk art is always changing–morphing from the very traditional to the very contemporary, or a mix of the two–works like this are my personal favorite. The work of the Blanco family exemplifies such a process. They live and work in the town of Santa Maria Atzompa, Oaxaca. Teodora Blanco, the matriarch of the family passed in the late 1980’s, but the innovative style she developed is carried on by her children and other relatives. Teodora’s signature pieces were female figures she playfully dubbed “munecas” or dolls, covered with “pastillaje.” “Pastillaje,” one of Teodora’s aesthetic innovations, involves attaching many small figurines and flowers to a piece, giving it a dense, deocorative look. The pastillaje typically depicts traditional Mexican motifs, such as caballeros, campesinos, and the iconic marigolds of Dia de los Muertes. Teodora’s daughter, Irma Garcia Blanco, among other things, makes pastillaje-decorated ceramic “baskets” while her sister-in-law, Delfina Cruz, makes whimsical munecas, mermaids, and other figures. 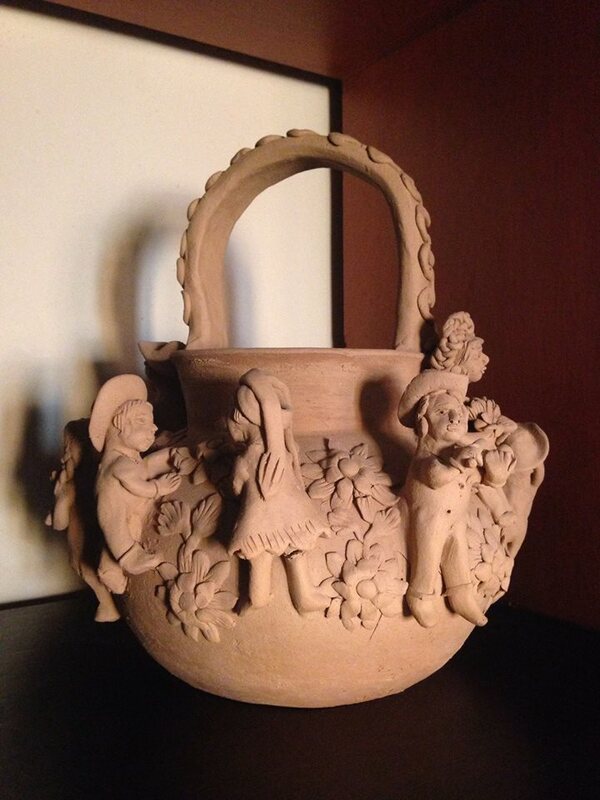 The family uses local, low-fire clay for all their works. Larger works are fired in sections, but notably, the delicate pastillaje is applied before firing, as opposed to being attached later with a fixative. Irma and Delfina leave their works unglazed to highlight the smooth, khaki color of the clay and the detailed decorations. The monochromatic scheme makes their work stand out–they combine a modern, simple look with Mexican motifs in an amalgamation of styles that is unprecented. Teodora’s grandson, Fernando Felix, on the other hand, makes works that explore the facets of mimetic realism–a striking change from his grandmother’s and mother’s styles. I love the work of the Blanco family, and I can’t wait to see how their work evolves. If Fernando’s work is any indication, we can expect new and modern twists on his grandmother’s definitive style! 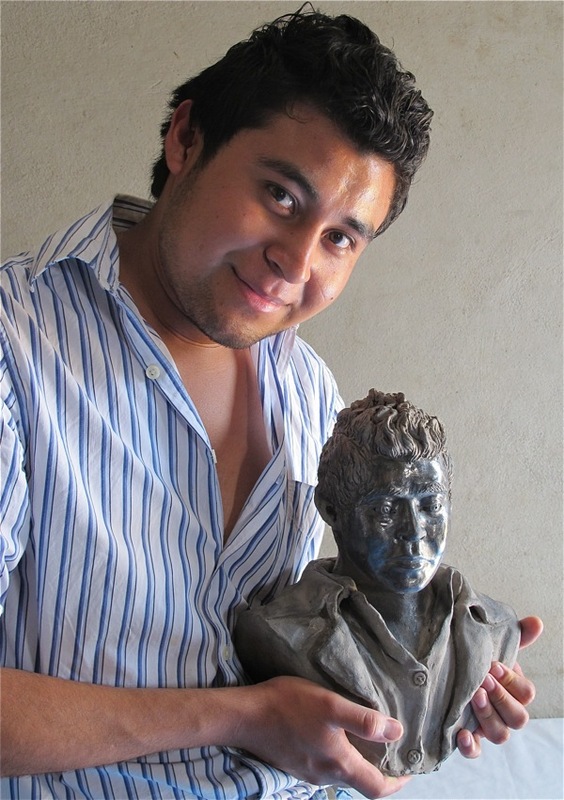 Visit Casa de Los Venados here in Valladolid, Mexico, to see many of the Blanco family’s beautiful works. “THE BLANCO FAMILY (Santa María Atzompa).” Friends of Oaxacan Folk Art. N.p., n.d. Web. 16 June 2014. Tides0, Texas. “Clay Sculptures by Irma Garcia Blanco.” YouTube. YouTube, 06 Apr. 2009. Web. 16 June 2014. Tagged Art, Ceramic, folk art, Mexico, VallalodidBookmark the permalink.